Fans of the crazy cat and macho mouse can look forward to a boxed Blu-ray set of animated shorts this October. 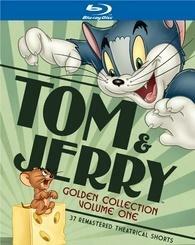 In an early announcement to retailers, Warner Brothers is preparing 'Tom and Jerry: The Golden Collection - Volume One' for Blu-ray on October 25. Special features will include nine commentaries by animation experts and a brand new retrospective featurette Vaudeville Slapstick and Tom and Jerry. You can find the latest specs for 'Tom and Jerry: The Golden Collection - Volume One' linked from our Blu-ray Release Schedule, where it's indexed under October 25.